Occasionally I like to take my creativity over to the working world side and see if they want a taste. Usually they laugh at me (until the gnomes get even that is) but I think I’ve got a sure-fire print ad campaign this time. 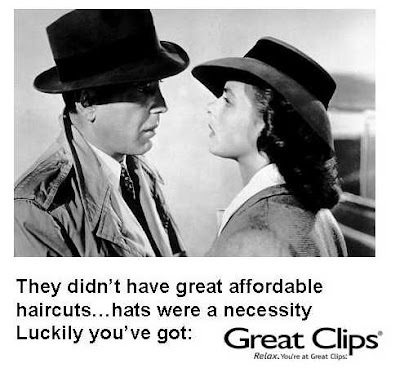 I’m melding famous movie scenes with products and companies for strong visual print ads you won’t forget. You know, like that one product a long time ago…err…whatever it was. Love the last one! That's the best one. I would totally use Peninsula Funeral Services! Hmmm...you could also sub the first for the last...um...then again, that may be too direct? I think Madison Ave. needs a shake-up, heh, heh...and can we get these products at Half-Mart? So wrong that this is yet another for your "Greatest Hits," maybe even your greatest. I'm not first. But I think all these companies should use these ads! My name is Quirkyloon Montoya. Can you give us the 1-800 number for Peninsula Funeral Services? I agree with the others... these are good. Reminds me of the old Mad Magazines. They used to do stuff like this. I have a hole in my hose. It makes cleaning out the chickens uncomfortable as it drips down my wellies. Very funny, I think you've found your calling! perpetual chocoholic - Ah yes... the coveted first comment... you earned it! anne - Doh! See what happens when you actually comment after reading the post...you end up in second. incredible woody - They'd be famous, don't you think? subtorp77 - Yeah, you can get half of them at Halfmart! kanrei - Thanks. I'll have to add it to the greatest hits page. I always forget to update that one. megan - I agree and I'll tell them that cash works for me as payment. mama-face - I strucketh it to the corporate naysayers! quirkyloon - Bad eyes? Inconceivable! jeff - Yeah, I remember Mad magazine. Are they even still around? English Mum - Buy some new hose...what are you...chicken? anne - They're quick here... anything to get that coveted first comment. Ha! Speaking from the other side of my life where I've been analysing and commenting on ads for over 15 years -- these definitely have potential. I think my favourite may be the funeral home, but that could be because I love Princess Bride. As someone who works in advertising, I've got to say this cracked me up. Most are funny, but some are brilliant. 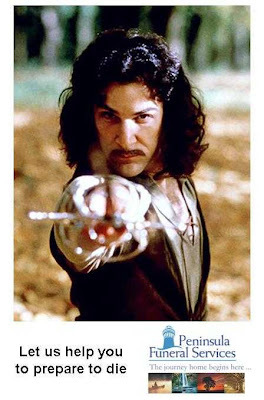 The Advil/Lebowski killed me, but Funeral Service/Princess Bride totally rules - it's my new screen saver. freetheunicorns - You work in advertising, eh? I'm guessing it's not as creative or fun as it might seem. Glad you liked them...the funeral one is my favorite too. Can any of these boost my manliness? I think you’re on to something with that last one. Funeral Homes & Euthanasia combined in one business. F*ckn awesome! 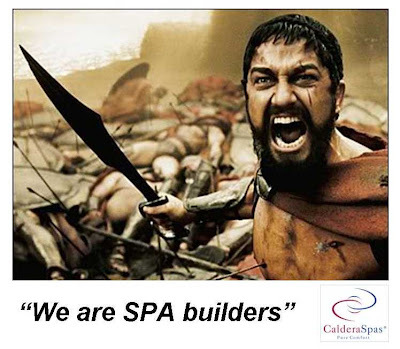 SPA builders *chuckle* means something a little derogatory down here! If those two people try to kiss, their hats are going to bump into one another and fall off. I guess that could be a cheap form of birth control. And I thought she was screaming because of the knife. reforminggeek - Oh, that silly old knife prank...that should have been so obvious! 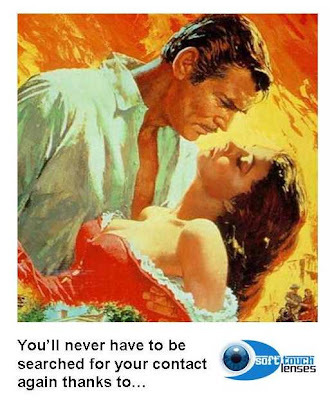 I think I'm going to miss being searched for contacts. ronda - They just don't do it like they used too, huh? those are great. "hello! my name is ingio montoya. you killed my father. prepare to die"
ok, the last one is my favorite hands down, even the hands with 6 fingers. I love the last one. My favorite. jaime - We have a lot of Princess Bride fans reading here! lime - I could have just gone with that one and the post would have been a hit! Great stuff, VE. 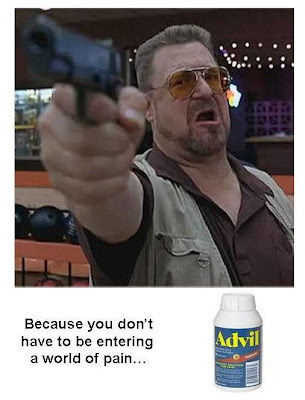 I just watch 300 again the other night, and I particularly liked the spa ad. The ad for Peninsula is really good, too. I'd market both of them in real life, in fact. mikewj - The spa ad is my second favorite of the bunch. The funeral one is my first. 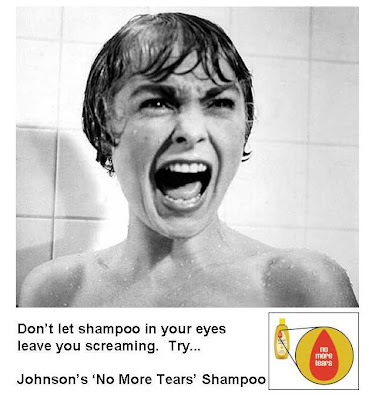 Geez, I can remember when "No More Tears Shampoo" first came out, oh hell I can remember when people first started to get color TV's. No more ads. That is my new motto. Okay, I am stopping for tonight and gonna go vote. I will catch up on all the ones I missed later.